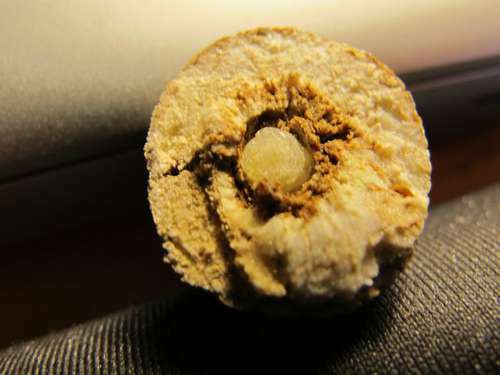 The large and messy hole in this gall indicates it was probably opened by a chickadee, which lacks the dexterous drilling ability of a woodpecker. 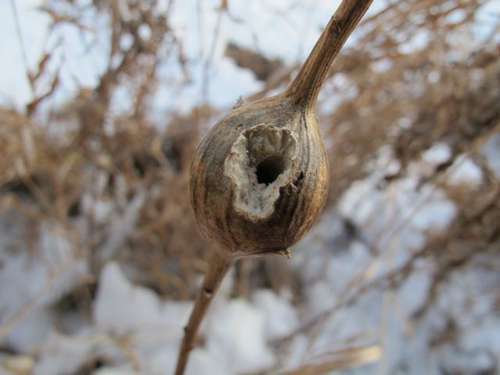 Heres the prize  a goldenrod gall fly larva  all tucked in for the winter. It survives subzero temperatures by producing a glycol antifreeze. 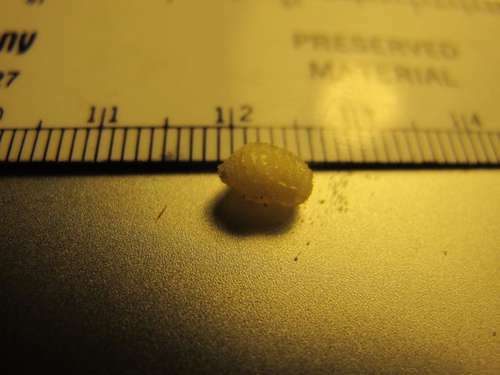 The gall fly larva is only about 5-6 mm long (1/4 in. ), but an important food source for downy woodpeckers, helping them survive the winter. Once upon a time there was a downy woodpecker, well call him Dowo. Winter had just fallen on the land in Minnesota. It was cold and snowy and Dowo was hungry. He had stashed away winter provisions, like seeds and nuts, in lots of nooks and crannies in the woods, but it was only December. If he ate his provisions now he would have nothing for the many cold days ahead. Sitting on a branch near an open field, something swaying among the grasses caught his eye. Swooping down to investigate, he discovered a woody sort of lump on the stem of a goldenrod. The average bird might think nothing of this, but Dowo was no average bird. He had a hunch this was something interesting (i.e. food). He took a few trial pecks, then a few more. It wasnt long before his effort was rewarded  curled up in the center of this gall was his prize: a nice fat grub. With his long barbed tongue he snatched out the grub and devoured it. He went on to find many more of these grubs in the field, consuming them all over the next few weeks. Each one was a fatty, rich morsel that provided much needed calories for this small bird. And so, Dowo was saved and lived happily ever after. The end. ...Well, not quite. As usual, there is more to the story, and our inquisitive Phenology readers want to know: What kind of grub is that? and how does it survive the winter (if its not eaten by birds)? Woodpeckers tend to favor large galls, so areas with a lot of woodpeckers will tend to have small galls. Areas with a high parasite population will have larger galls, because they are less adept at penetrating thick gall walls. And if there are both high woodpecker and high parasite populations, the galls will be an intermediate size. Downy woodpeckers arent the only ones to discover these mighty morsels. Chickadees will also occasionally snack on them, though theyre not as neat drillers as woodpeckers and tend to leave large messy holes. In addition to birds, there are other tiny predators, such as wasp parasites. Canada goldenrod is a robust native plant that dominates many fields and roadside areas. Like most things, goldenrods have both their benefits and detriments. Those of us in the restoration business are not particularly fond of it because it crowds out other species and its a pain to walk through a solid stand. However, the plant is very important for the dozens of bees and other insects that call the plant home (or at least kitchen!) in the summer months. Check out some of the resources below to learn more. Better yet, go to the nearest field and gather some galls and investigate for yourself!